I’ve been studying the drone ecosystem in-depth for more than a year, initially resulting in the Future of Frontier Tech report I wrote at CB Insights. Today, as an investor at Rothenberg Ventures, I’ve continued to dig deeper in an effort to identify the key opportunities emerging within each part of the drone stack. As a team at Rothenberg Ventures, we’re continually honing our thoughts and speaking with experts across all areas of Frontier Tech. We operate with key beliefs across each sector that allow us to establish a baseline framework for evaluating the thousands of companies we see each year. Our conviction for the drone ecosystem began in early 2014 when we seeded the drone operator marketplace, Dronebase, and continued with multiple investments in our most recent River class. As we continue to invest in drone startups, we are developing multiple core beliefs surrounding drone infrastructure, services, hardware, and more. Some of them may change over time, but we thought it would be helpful to share our thoughts in the interest of collaboration within the drone ecosystem. See below for a detailed breakdown. Around 1 million drones were expected to be sold this past holiday season. With increased consumer adoption, Section 333 exemption issuances, and more regulation expected by Q3’16, we will need to manage sub-400 feet airspace. In speaking with industry and legal experts we’ve learned that a lot of this airspace will be managed with both a vertical and horizontal approach. Municipalities will largely be in control of the airspace with the FAA having a horizontal set of rules and control as a governing body across the United States. A software layer will manage this. Air Traffic Control (ATC) & Fleet Management. We expect Beyond Visual Line of Sight (BVLOS) restrictions to gradually change over the next few years. Tech giants such as Google and Amazon have made their delivery aspirations clear, however, there will be multiple public and private entities operating fleets of drones across dozens of use-cases. As with any asset-heavy model, these drone companies will eventually reach a point where they must manage and observe their fleet’s activity in real-time. We are interested in funding startups that are the fleet management layer of the drone software stack. 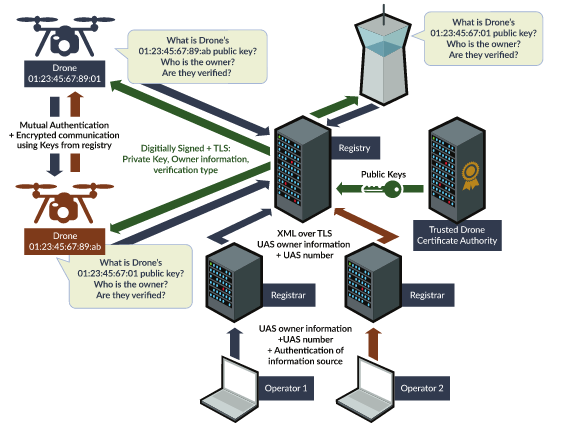 Drone detection and defense. A proliferation of drones will inevitably lead to uninformed fliers in addition to bad actors. We’ve already seen attempted drone deliveries into prisons, near-misses with airplanes, crash landings at the White House, and more. The ability to identify and control rogue drones is critical moving forward. While some of this may be handled by ATC and fly/no fly information providers (like Airmap) at the hardware level, bad actors will always be able to remain off the grid to a certain extent. We’ve learned about the various potential workarounds for many of these systems, but that is no reason to not defend against the 99% of drone operators. Hardware is becoming a commodity with well-capitalized, innovative players such as DJI, Parrot, 3D Robotics, Yuneec, and others dominating standard quadcopter hardware (and even expanding into vertically-focused drones in some instances). Because of this, we believe that enterprise drone hardware will serve as “platforms” for payloads and other enabling technologies. On the consumer side, we believe that drones are one of the next camera platforms. Unique form factor. We are interested in drone manufacturers with a unique form factor (like Vantage Robotics, Ascent Aerosystems, or Flyability) as well as startups innovating on existing hardware platforms for specific use-cases. This includes startups working on endurance technology, tethered drones, as well as increased payload solutions. Fixed wing & hybrid drones. Few players have attacked the consumer fixed wing market. The endurance afforded by fixed wing drones could prove that form factor superior for some enterprise use-cases, including long-distance logistics and surveying, as well as “macroscopic” monitoring. We also are continually tracking innovations in the hybrid form factor of fixed-wing with VTOL capabilities (like XCraft). The enterprise appeal for drone services tackles multiple billion-dollar sectors. Within construction, precision agriculture, oil & gas, and more, drones pose massive increases in efficiencies as well as decreases in costs. There will be a new wave of private and public players entering the drone services segment over the next 2–4 years, and we are already seeing that ramp up, speaking with an average of 1 new drone services company per week over the past few months. Vertically focused insights. Gathering data via drone, whether it’s agricultural heat maps or volumetric data of a quarry, is just step 1 of the services model. We’d like to fund teams that have deep expertise in their vertical with the ability to gather data and then provide easy to process, actionable insights on top of that data. With a vertical focus, services companies can build a data moat that creates a type of network effect across all of the company’s customers. Full Stack Services. Companies that can provide a full-stack solution today will provide specialized hardware to software to insights (Kespry). If your stack includes specific technological IP related to an area (such as a sense and avoid tech that specifically targets wind turbine monitoring a la SkySpecs) this will help prove out your vertical approach and will show a key understanding of how you build better processes to scale within a specific vertical. Logistics. This is a huge market that will not be solved only by large incumbents. There is a lot of enabling technology that will be sold direct to OEMs and service providers. We are very interested in the ability to “level up” a drone across autonomy, data collection, and usage, thus these enabling technologies will be valuable. Collision avoidance/sense & avoid. Improving autonomy for drones is a necessity. The thesis is simple: As more drones populate our skies, fleet management and ATC will play a key role, however on-board obstacle avoidance will also be a key driver in enabling fleets of drones. The industry today is split on whether to go entirely on-board (Amazon) versus every drone reporting to a central operator (Google). It is most likely that a hybrid form of both technologies is what will ultimately happen. For consumers, sense and avoid is incredibly important as follow-me drones like Lily begin to ship. We would not be surprised if multiple drone owners express disappointment once their new $900+ piece of equipment breaks because it was “flying blind” and crashed. We want to invest in companies fixing that pain point, as well as those servicing the multiple enterprise use-cases for urban and suburban areas and getting close to a specific object. Endurance infrastructure. Battery-powered drones with 20–45 minute flight time will continue to present operational bottlenecks. We want to invest in startups looking to solve these issues with solutions ranging from automated docking and charging (HiveUAV, Skyfront) to swarm collaboration and more. Disclosure: We are investors in HiveUAV, a company which combines drones and automated docking stations to help multiple industries monitor remote locations from the air via automated docking and charging stations called “Hives”. Sensor development. Operators will continue to gather more data, thus we are interested in startups innovating on the sensor payload to enable unique datasets via drones (like Quanergy). Operator Marketplaces & Training. Not all drone use-cases will need consistent usage, however they still will be immensely valuable on a contract basis. As I previously mentioned, we are investors in DroneBase, one of the world’s first drone operator marketplaces. We are firm believers that low-cost drone services will have a lasting market and we have seeded what we believe will be one of the key players in that segment of the market moving forward. Overall the drone ecosystem is still in its infancy, and thus these are dynamic core beliefs that will change as we learn more and continue to back great teams in the coming years. Whether you’re an entrepreneur working on an awesome drone startup, or someone who just wants to chat more, I’d love to hear from you! Reach out to me on twitter @mhdempsey or via email. No idea is too early and we’re always looking to help.